U.S. Federal Route 10 runs east-west across Central Minnesota. This highway follows the Interstate 94 corridor across the state. It goes from the Red River of the North crossing, at the North Dakota/Minnesota State Line, near Fargo, North Dakota, to the St. Croix River crossing, at the Wisconsin/Minnesota State Line, near Prescott, Wisconsin. Info on U.S. Rt. 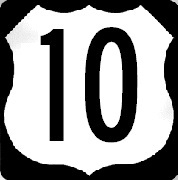 10 is broken down by county below.